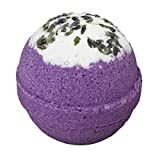 LARGE, LUSH BATH BOMB: About the size of a tennis ball(4.5-5oz each) – compare to most others, which are about the size of a golf ball. HOMEMADE BY MOMS IN THE USA: All of our bath bombs are hand made by flex-working Moms in small batches in the USA in our home state of Minnesota. We’re flex-working moms on a mission! HARMONY IN YOUR HOME – Each set of 6 Bath Bombs is perfectly balanced with a pair of Lavender(2), Orange(2), and Eucalyptus(2) Oil bombs so you can choose a unique, immersive experience every time you settle in for some sweet relaxation. Because each ball is infused with a natural, aromatic oil, your bathroom will be instantly transformed into a sanctuary to your senses. 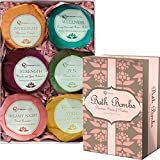 YOU DESERVE IT – This Hand Selected Bath Bomb kit Contains a total of 6 Sensory Experiences that take you into the depths of serenity and relaxation. You can choose from a calming experience (Lavender) after a long day at the office, a relaxing yet stimulating (Orange) reboot before dinner or a night out on the town, or an immersive, rejuvenating journey (Eucalyptus) to recharge and prepare you for the following day. NOURISHMENT FOR BODY & MIND: Each ball is packed full with the powerful antioxidants of essential oils that are ready to dissolve in your tub to cleanse, detox, heal and nourish the skin. Each bomb is made with a natural clay combined with shea butter, almond oil, mineral salts, and essential oil because they work in synergy to soothe itchy and dry skin, nourish and rejuvenate, while deeply moisturizing dry skin to help reduce wrinkles and blemishes. 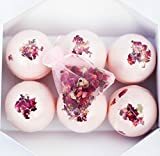 IT”S THE PERFECT GIFT, TOO: Each Bath Bomb set is carefully packed in Elegant gift set packaging that makes these marvelous balls of relaxation look like precious treasures. If you’re looking for a great gift for moms, teen girls, your significant other and men – this set will not disappoint. We’ve combined five star quality with exquisite presentation, so it’s bound to make a lasting impression as a gift, and leave the recipient smiling with excited anticipation to try them out in the tub. YOU’RE GUARANTEED TO LOVE IT – If for any reason, you aren’t happy with your new Set of Bath Bombs, just send them back to us for a prompt and full refund. We want to help you make life easy and keep you feeling (and looking) so amazing that you shine with confidence. If you don’t feel like we have done that, let us know. So click the Add to Cart button now, knowing your purchase is protected with our Money Back Guarantee. 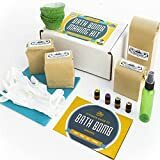 Brand: Bath Bomb Kit Co.
MADE IN THE USA: By people who love making high quality products with high quality ingredients for high quality people. Ingredients include all natural, gmo free, pharmaceutical grade… did we mention the 100% pure essential oils? 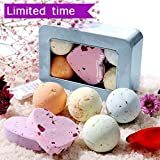 LUXURY BATHS FOR EVERYONE: This unique set of bath bombs will allow you to enjoy luxurious baths combined with a rich, elegant aromatherapy session that will let you relax, detox, invigorate and enjoy yourself. 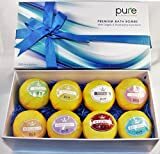 Enjoy a set of 8 bath bombs, each designed for a specific purpose, with hand- picked essential oils that will benefit both your skin and soul. A WORLD OF BENEFITS; BEAUTIFUL SCENTS: Enjoy 8 unique bath bombs that will offer you a spa- level treatment in the comfort of your home. Inside our bath bombs you can find and enjoy essential oils such as Shea Butter, Ylang Ylang, Jasmine, Rosewood, Orange, Bergamot, Peppermint, Ginger, Tea Tree, Eucalyptus and many more rejuvenating and skin repairing oils. SOOTH AND REPAIR YOUR SKIN: There’s no better way to benefit your skin than providing it with deep hydration and essential oil-based care. If you’re suffering from dry skin, eczema and psoriasis, these spa fizzies just might be what you need to overcome your skin ailments. READY TO GIFT: These high quality bath bombs come in a sleek, beautiful box, wrapped with a ribbon and equipped with a hangtag. The elegant packaging is bound to leave an amazing impression. Trust us when we say: there’s no better gift than large bath bombs (at a generous 4 oz each), packed with premium therapeutic essential oils. FULL SATISFACTION OR YOUR MONEY BACK: That’s right! We take great pride in the fact that we strive to provide you with simply the best bathing accessories possible. If for any reason you are not satisfied with our fizzies, you can enjoy a swift and full refund. NEVER BE BORED WITH YOUR BATH BOMBS: We have over 30 possible scents, with new ones added regularly! Some of our scents include: Coconut Lime, Salty Sea Air, Lavender (with therapeutic Lavender oil), Bamboo & Sugar Cane, Toasted Marshmallow, Macintosh Apple, Love Spell (VS type), Honey Suckle, Amaretto Tiramisu (with Arabica Coffee), Bora Bora, Angel in Black Dress, Kimono Flower, Pink Sugar, Mango Blend, Peppermint (Essential oil), Black Raspberry Vanilla, and more! NATURAL AND HANDMADE: Handmade in the USA with all-natural ingredients. Our bath bombs won’t damage your skin or stain your bath tub. Includes skin safe mica and food grade colorants. Cruelty free and never tested on animals! FLEUR COLLECTION: Bath bomb floral mix of rose, jasmine and gardenia scents with added real rose petals and buds on top for a herbal bath. LUXURIOUS HYDRATION: Made with Kokum Butter, White Kaolin Clay and Jojoba Oil to hydrate and moisturize your skin and leave it as soft as it can be. INCLUDED: A beautiful organza bag to help with picking up petals after your bath. HANDMADE WITH LOVE: by a team of cosmetic professionals in California. These bath bombs are made in small batches for perfect quality control. We can assure your bath bombs will be cruelty-free, vegan and free of GMOs, Sulfates, Phthalates, Parabens, & Gluten. THE BLOOM GUARANTEE: We issue all of our costumers an unconditional blooming guarantee. We know you will bloom when using our bath bombs. SOOTHES & RELAXES – Pamper and indulge yourself into an amazing calming and soothing bath experience after a hard day of work. 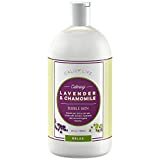 The Calily Life Bubble Bath Soak is formulated with specially selected essential oils and natural extracts; known for their calming, soothing and skin nourishing properties. Contains Lavender, Chamomile, Aloe Vera and other natural extracts and minerals. Enjoy a luxurious bathing experience in the comfort of your own home! NOURISHES & HYDRATES – Features natural cleansing and hydrating extracts that gently purifies, moisturizes and deeply nourishes the skin, while leaving behind a fresh and light scent. ORGANIC OILS & EXTRACTS – Indulge into a serene oasis of lovely scented pure organic oils, relishing in the delightful and long lasting bubbles, while allowing the timeless aroma of pure essential oils and extracts to pamper your mind and body. A 15-20 minute soak provides nourishing stress relief, while promoting calmness and relaxation that helps drift into a deep and soothing sleep. HYPOALLERGENIC & GENTLE – The Calily Life Lavender and Chamomile Bubble Bath is Paraben free and FDA compliant. Features a hypoallergenic soothing blend; safe for sensitive skin and is not associated with any side effects. Dissolves quickly, and does not leave any bathtub residue. Maybe be used daily. Great for adults and kids. CONCENTRATED & PREMIUM FOAMING – The Calily Life Bubble Bath is formulated with a blend of concentrated premium foaming extracts that creates a tub full of large and long lasting bubbles, while using a small amount. Enjoy the bubbly warm bath!